Lucy and Jean pose with their salesperson Pierre Comtois (left) as they take delivery of the all-new 2019 Kia Niro EV. This happy couple says no more spending money on gas! We thank you for your business, enjoy your new electric car and all the savings that come with it. Get your 2019 Kia Niro at West Coast Kia! Jason from Victoria, BC has been waiting for a fully electric 2019 Kia Niro EV for several months. As soon as his car came in, he jumped on a plane and came to pick it up. With the help of his sales person Pierre Comtois, Jason is thrilled to be driving the first Niro EV sold by West Coast KIA. Thank you very much for your business Jason and enjoy your new car and the fuel savings! Paula and Wendy have been customers at West Coast KIA for many years. Recently they found their KIA Sorento was getting on in age and decided that it was time for a new one. With the help of their sales person Troy Plexman and all of the staff at West Coast KIA it wasn’t long before this couple were driving back to Hope in their new vehicle. Thank you both for your business and for your loyalty to West Coast KIA! Craig brought his daughter Lauren to West Coast KIA after the vehicle she had been driving broke down. With the help of her salesperson Pierre Comtois it wasn’t long before Lauren was driving away in the beautiful brand new 2018 KIA Rio! This was Lauren’s first time applying for a loan and she was thrilled to receive instant approval! Thank you very much for your business Lauren and the confidence in our ability to help you with the process. Enjoy your new car! Congratulations to Earl from Coquitlam, BC on the purchase of his 2017 Kia Forte SX from Philip Kang! Earl enhanced the design of his Forte SX with the addition of body mouldings and they look great! We appreciate your business Earl! Enjoy the new ride! Christina and Ashraf Couldn’t Be Happier After Buying Their Matching Kia Souls at West Coast Kia! 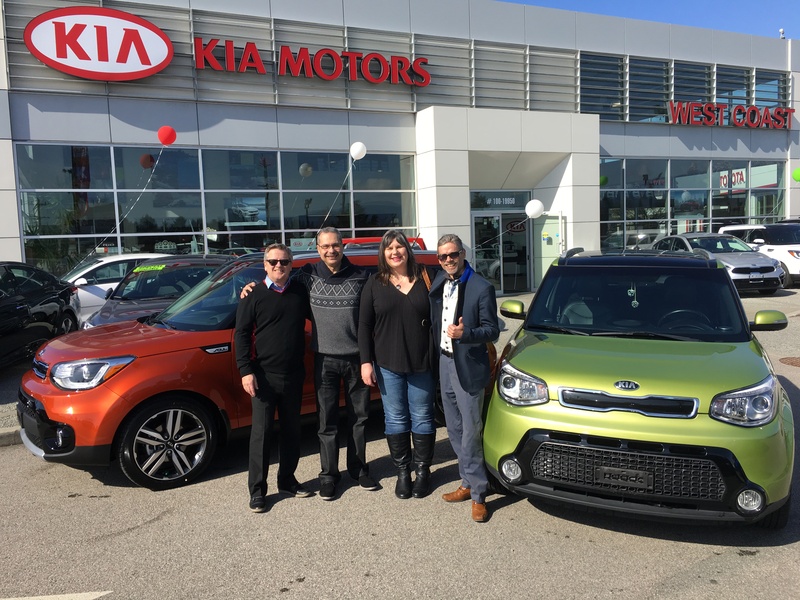 Happy customers, Christina and Ashraf are very excited to be taking home their matching Kia Soul’s from Sales Associates Ken and Pierre. Congratulations Christina & Ashraf, it was an absolute pleasure helping you!! At West Coast KIA we love to help people and when it comes to our dealership, Troy Plexman is number one in that department. After listening and learning what his customer’s needs are Troy is able to find the perfect vehicle to fit their needs and budget. Troy did his very best for this happy couple Nakita and Matt and found a vehicle that worked well for both. When Nakita and Matt came to the dealership their requirements were safety and usability for now and into their future. With children, it was all about being safe and getting from A to B and what better way to do that than with All Wheel Drive and locking four-wheel drive? With the help of Troy they looked at the Sorento AWD and the Sportage LX AWD, after much consideration they decided on the beautiful Sportage EX and loved it. Welcome to the West Coast KIA family Nakita and Matt, Troy and the team wish you many years of great driving ahead. Congratulations to Sylwia and family on their new 2019 KIA Forte LX. This is Sylwia’s new vehicle and it’s about time! After purchasing her last car, a 2009 Pontiac Sunfire and getting the full 10 years out of it, was time to jump up to a new one with all the bells and whistles and what a jump it is. The all-new 2019 Forte has a plethora of options even in the base model that absolutely thrilled her. Their sales person Troy Plexman went over all the features and benefits, from the options to the huge warranty as well as the great interest rates. After one long test drive Sylwia knew she had found the right one. Welcome to the West Coast KIA family, we are super happy for you! Andy and Rebecca were referred to West Coast KIA all the way from Bowen Island, BC! This happy couple came in looking for a 7 passenger SUV and with the help of their sales person Ken Miscisco it wasn’t long before they found the right vehicle for them, with the KIA Sorento. West Coast KIA thanks you for your business welcome to the West Coast Family and enjoy your new KIA!